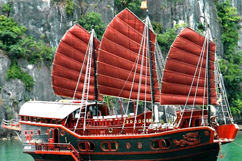 Named and designed after an authentic Chinese junk, the original Red Dragon plied the rivers, seas and harbours of the Far East, from Singapore to northern China. 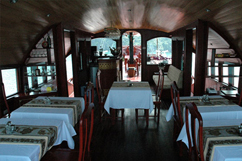 The Red Dragon is complete with five deluxe cabins and designed to resonate with superior class and grandeur. 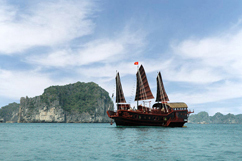 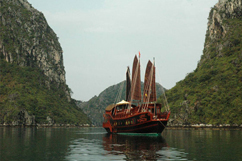 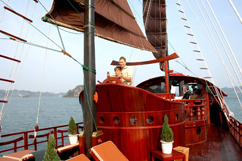 Larger than The Prince and Princess it is still small enough to get up close to the natural wonders, pocket lagoons and small fishing communities of Halong and Bai Tu Long bays. 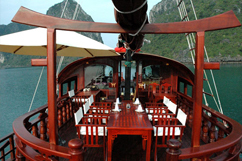 As soon as you board the Red Dragon, you will be surrounded by traditional handmade artisan woodwork. 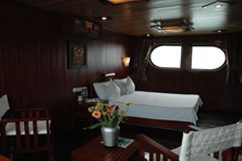 Whether you are relaxing in the comfort of your own cabin, lounging on the spacious sun deck, or dinning in the cosy restaurant, you will feel treated like royalty. 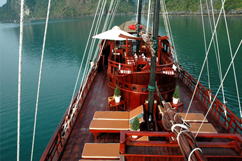 This masterpiece is a wonderful option for those who need a little more space for a small group cruise of up to 11 people. 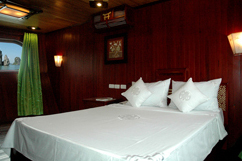 Room amenities: Individually controlled air-conditioning, Slippers, Wardrobe, Separate bathroom cabin with glass-standing-shower, Bathroom amenities, 24 hour room service, Bottle of water on available and Hair dryer. 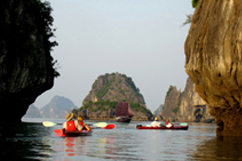 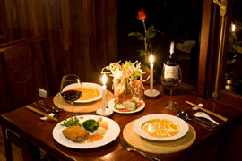 Sport facilities & activities: Tender, Bamboo rowboat, Kayaking, Cooking (upon request), Caving, Swimming, Life vests, Fire extinguisher/ Smoke detector Special events: Traditional or modern music, Traditional or modern dance, Wedding, Birthday/ wedding anniversary, Beach party and Inside cave party.